on a battered Breezer with panniers and a box on the rack full of baby tomato plants. She’d blown silently past, and as usual, I clung like a burr to her wheel. A few veers across the (surprisingly un-busy) road and I conceded that some folks need to give permission for a burr to be on their wheel. I’d noticed she was constantly fiddling with her music in the rear right pocket (reminding me of the 2009 Vodka ride, where it was routine to see an arm bend back and do something to the pocket every half hour or so). Her food fell out of the pocket–piece of PB & J sandwich, and a homemade macaroon (I scooped up the baggie without even stopping–it’s one of my skills). Alas she sped off before I could give her back her snack. ANYWAY she helped me go from a little late to Right On Time to the Russian Chamber Orchestra Mother’s Day Concert. I thought about 30 years. 1982…the year I met Charlie. No, I met him in 80, on the Appetite Seminar ride… Ok, so 30 years ago I was just getting into the Marin scene. But two years after that, I was leading a women’s ride/camp in Point Reyes, with the redoubtable Casey Patterson (nee Kelley). No luck getting her, or Ramona D’Viola, the other trail guide on that incredible day. 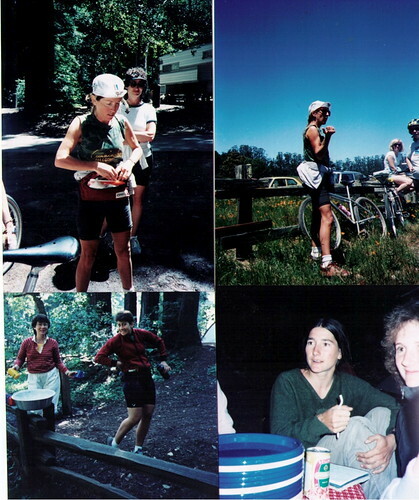 The very first mountain bike camp ever, in the world. ~ by jacquiephelan on May 13, 2012. Your on-the-fly pickup abilities would make you a great bike-frisbee player. We do this silly thing every Monday night where we play Frisbee while on bicycles. It amounts to a combination of Ultimate Frisbee, hackeysack, keep-away, and a mob scene. We also usually scrape up a potluck picnic and take a halftime during the game whereupon we feast upon the bounty. Good, good times. If you do make it back to Kansas City, you’ve definitely got to come to Friz!